We are putting a cantle binder on first thing this morning. The binder has been skived where needed and glue applied, after which we will soak the binder in water so that it will be pliable to shape during installation. The binder will need the better part of the day to dry before hand sewing so we want to put them on in the morning first thing or last part of the day so we don’t waist time in the shop on it drying. Well it’s upon us again. Seems like we just finished the Christmas season, and here we are set up at the George Strait Team roping Classic in San Antonio, TX. This is our third year attending this event and we are looking forward to seeing our friends and making new ones. 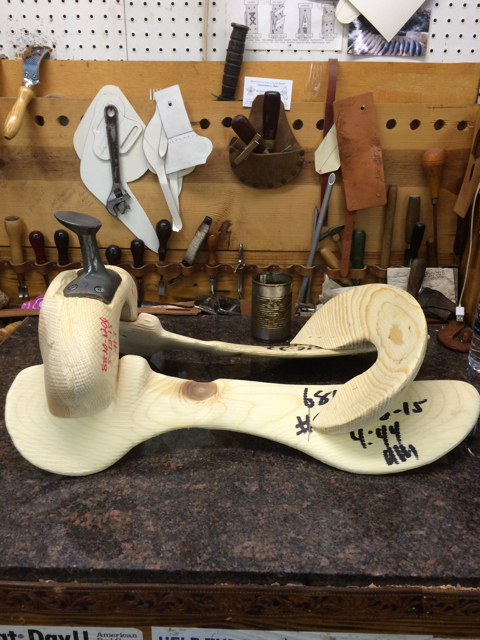 Like every year in the past, we try to start early and have two or three custom saddles made for this show. Again this year we were only able to bring one. With our growing order list and the demand our saddles have at home, we were only able to escape Brazos county with one. This is the first time in our three years here that the weather has been bad. It’s currently raining and cold, so the ropers will have to contend with cold fingers if they want a chance at the money, truck and trailer. Good luck to all the contestants! And to all the spectators, set back and enjoy some of the best team roping action on the planet!